You could go to/depart from Hongqiao Airport Terminal 1 by the Subway Line 10 (Identification Color: light purple). 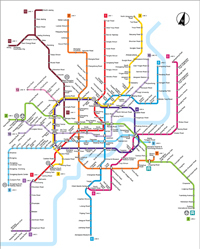 The Subway Line 10 go through the main subway station: Hongqiao Airport Terminal 1, Shanghai Zoo, Jiaotong University, Shanghai Library, Xintiandi, Laoximen, Yuyuan Garden, East Nanjing Road, Tongji University, Wujiaochang etc. Special Notes: There have a branch at Longxi Road Station, please make sure the destination of the subway is right, if not, please get off and wait for the next train. Ticket price between two ends costs CNY 6, and costs CNY 3-6 for the rest.